We’d love your help. Let us know what’s wrong with this preview of Other Lands Have Dreams by Kathy Kelly. 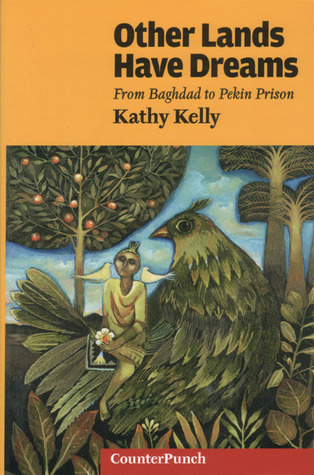 In the spring of 2004, human rights activist Kathy Kelly, twice nominated for the Nobel Peace Prize, was sent to Pekin Federal Prison for leading a protest at the School of the Americas. While in prison, Kelly’s organization, Voices in the Wilderness, was targeted by a US State Department lawsuit charging that Kelly violated US-imposed sanctions when she took humanitarian In the spring of 2004, human rights activist Kathy Kelly, twice nominated for the Nobel Peace Prize, was sent to Pekin Federal Prison for leading a protest at the School of the Americas. While in prison, Kelly’s organization, Voices in the Wilderness, was targeted by a US State Department lawsuit charging that Kelly violated US-imposed sanctions when she took humanitarian aid to Iraq during numerous visits over the last five years. To ask other readers questions about Other Lands Have Dreams, please sign up. This book is a good antidote to the mainstream media. This is the American assault on Iraq without the spin, as witnessed by an unembedded American who was there voluntarily, in solidarity with the local people. It is a cry of protest against what Americans are doing to the rest of the world, specifically to Iraq. The sanctions against Iraq were “child abuse” and “child sacrifice.” The United Nations is a “battered woman” bullied by the U.S. rogue superpower, the “world’s greatest killing machine,” which has an “unfortunate addiction” to war making. The suffering the author relates is horrendous, and it is real. Americans need to know about it. This book is important because it exposes ongoing crimes that depend upon secrecy. Warfare is “cruel stupidity,” says the author. It is little children grinding their teeth in fear while surveying adult faces for reassurance. It is “gut-wrenching explosions,” mud, filth, exposure, sleep deprivation, uncertainty, despair and death. And the victims don’t even know why they are being attacked! This book is authentic, written from inside the belly of the beast, an active war zone. From our “abysmally failed foreign policies” she proceeds to our “abysmally failed” prison system, as seen from the inside. She complains of “absurdly long sentences,” dehumanizing and cruel treatment, and disrespect for the family ties of inmates. Nonviolent lawbreakers are being scapegoated while lethal crimes in high places are ignored. She asks, are prisons necessary? And suggests alternatives, at least for nonviolent criminals. Not a comfortable read, but important. Although the sanctions are now history and the focus of American imperialism has shifted from Iraq, this book is by no means out-of-date. Would that it were! This book is incredible. Every person living in the US should read this book. I found myself crying several times. Interesting--I usually read novels, but bought it for my son who is a politics student. I decided to read it first. I knew the people of Iraq suffered and still do suffer great hardships. I was however shocked to read how people are treated in prisons in the US. what a beautiful human being. This book serves as a good reminder how economic sanctions and warfare hurt a large percentage of the besieged country's most vulnerable while hardly touching those in power. Serves as a haunting reminder that war and siege accomplish little except to destroy the lives of the poor, the elderly, and children. The writing is a bit tedious though. Probably because it is a collection of letters and newspaper columns rather than a coherent treatise on the subject matter. It also offers absolutely no This book serves as a good reminder how economic sanctions and warfare hurt a large percentage of the besieged country's most vulnerable while hardly touching those in power. Serves as a haunting reminder that war and siege accomplish little except to destroy the lives of the poor, the elderly, and children. The writing is a bit tedious though. Probably because it is a collection of letters and newspaper columns rather than a coherent treatise on the subject matter. It also offers absolutely no options - its basic suggestion for international relations is "be nice" with few alternatives offered to deal with rogue states and leaders. Thinking of Machiavelli, who observed a good man finds himself at an immediate disadvantage when surrounded by bad men. I don't really know what I can say about this book other than that you should read it. Every American should read it. Kathy Kelly is amazing, and I wish I had 1/100th of her courage to nonviolently resist war and fight for human rights. I suppose, if I met her or other people who have gone to Iraq with her over the years, that they would probably say that it is ordinary people like me who have these convictions but don't act on them, that we are the ones who need to step up and do something. Kathy Kelly embodies the ideal of concern and compassion for others. Kelly has served time in prison for her peacemaking including a stint in Pekin Federal Prison Camp for crossing the line at the School of the Americas in Fort Benning, Georgia. If you ever wondered why some people do civil disobedience, this book is a good place to start. Kathy Kelly is one of my heroes. I do know her, so I my review may be biased.